The south coast of Britain experienced an unprecedented influx of the migrant Tortrix moth Cydia amplana during the first half of August 2012. With favourable weather systems sucking up warm air off the continent many thousands, probably millions, of this normally scarcely recorded moth were swept into the UK. Counts approaching a hundred were recorded at light traps set at some prominent migrant hot spots along the south coast and the Channel Islands. 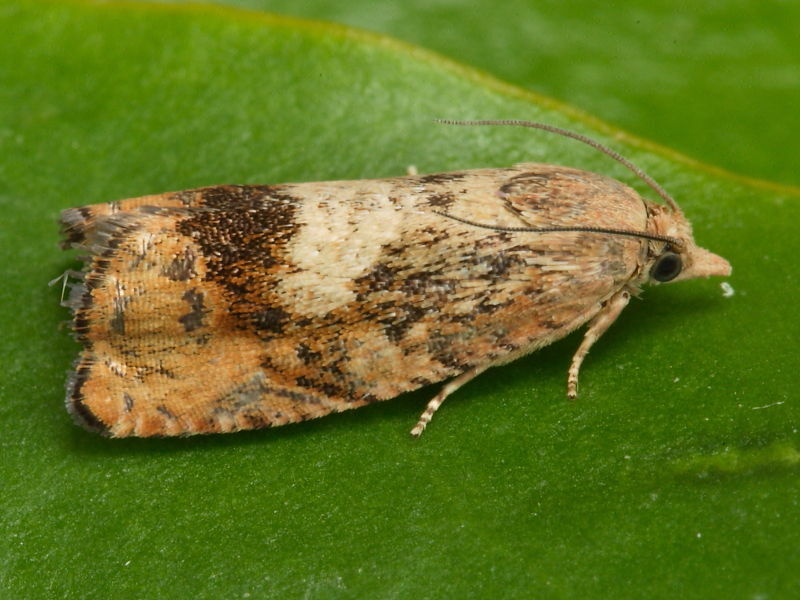 Generally, a light scattering of individuals were recorded along the south coast with a few records further inland. The identification of Cydia amplana, a member of the Olethreutinae sub-family of tortricidae micro moths proved fairly easy for even those lepidopterists who had never before encountered this species. 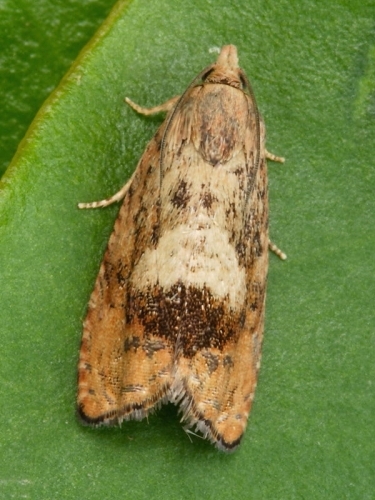 Despite many of the moths showing varying degrees of wear, like the worn specimen shown on the right, the most distinguishing features, the dark blotch towards the lower part of the trailing edge of the forewing and areas of rusty colouration, made the moths stand out even in the deceptive light given off by an MV light trap. Images shown are of some of the moths recorded in Falmouth on the coast of south west Cornwall during August 2012. 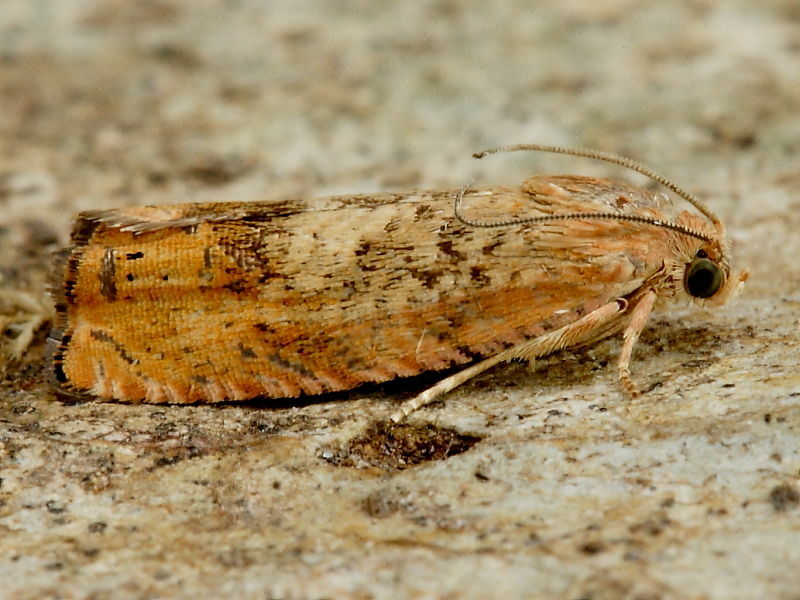 Cydia amplana has a wing span of up to 22mm and its main flight time is August. It was first recorded in the UK in Devon in 1990 and, until this year, most records since have been from the Dorset and Devon coastline. 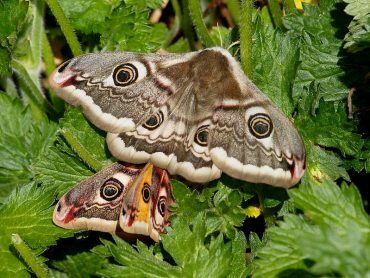 The recent influx of migrants were brought into the UK by weather systems sweeping up from central and southern Europe where it is a common moth, feeding on the nuts of a variety of deciduous trees and oak acorns. It will be interesting to see whether this large migration into the UK will result in any resident populations becoming established. Should it do so then its numbers are likely to be closely monitored as in some countries it is considered a pest of trees such as Sweet Chestnut.